I love to make my own puff pastry. It is time consuming, but the flavor is amazing. When you take that first bite and the layers just snap apart in your mouth as your teeth cuts through each flaky tier, you can't help but smile with pride. 1. Did I just waste $8.00 dollars worth of butter? 2. Will it rise in the oven? 3. How am I going to use this much puff pastry? 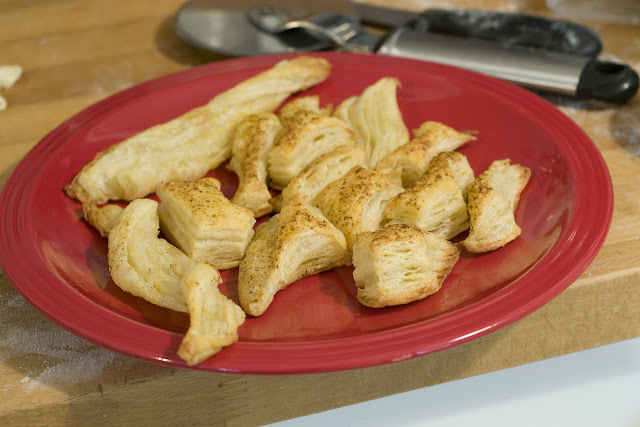 I always use the left over dough to make bread twist or cinnamon sugar treats for the kids. I brushed these pieces with butter and sprinkle Old Bay Seasoning on them before baking. "Super good"..direct quote from one of the teachers at school. I get a little bit excited about my puff pastry or I should say Emeril's because it's his original recipe that I use. You can find my step by step pictorial HERE if you would like to make your own. Fear not, because store bought works too! I have readers that range in "new" to experienced", so I like to give lots of options. I knew that a buffalo style appetizer was in the works when I made my first batch of puff pastry. I felt that the buttery layers combined with a cheesy sauce and spice chicken would shine. The key to making this appetizer be a success and not a mess is having the circles of puff pastry large. I used a 3.5 round cookie cutter. The cheesy sauce should be kept to a small spoonful. If you add too much they will spill over. 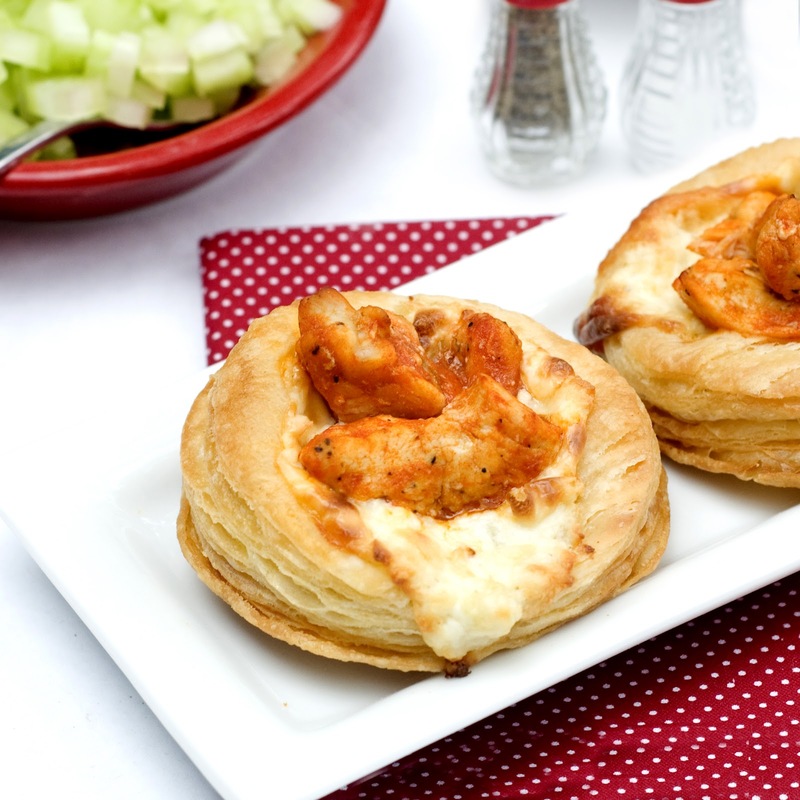 By adding the chicken after they bake, you insure that the layers all rise. You won't have the doughy bottom. 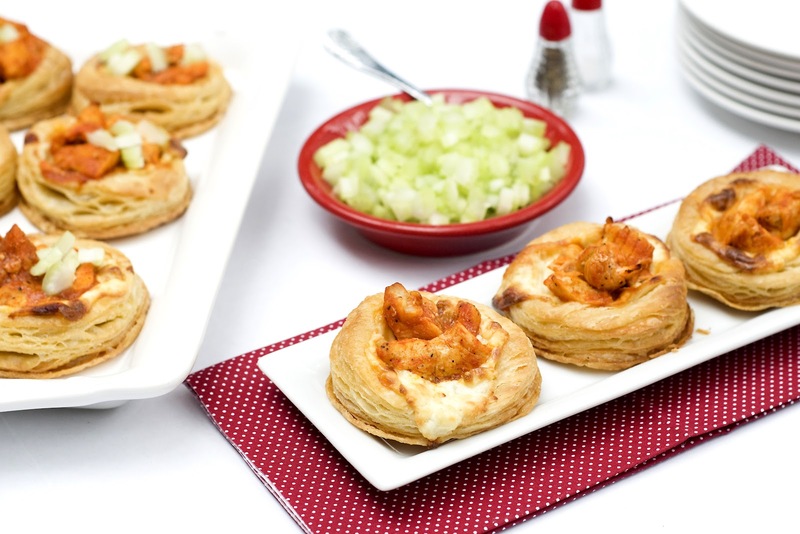 You are now prepared to make an appetizer that is sure to impress your friends. These can easily be made at home, covered and transported to your game day party. If they need to be warmed up, just pop them into the oven ( heated to 325) and warm for 10 minutes. Dice and cook chicken, drain off any juice and add hot sauce. Keep pan warm on stove. You will add the chicken right before serving. Flour your surface and roll out pastry thin. Less than 1/4 inch. 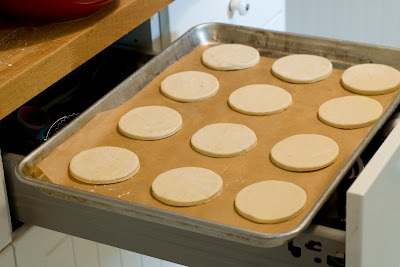 Using a 3.5 inch round cookie cutter, cut out circles place them 1 inch apart on cookie sheet that has been lined with parchment paper. Combine in a medium size bowl cream cheese, mayonnaise, 1/4 cup of celery, gorgonzola cheese and jack cheese. Blend until well combined. 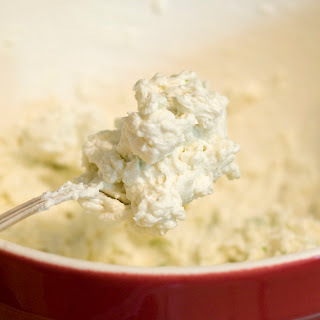 On each pastry circle add a small spoonful of cheese mixture. Spread with the back of the spoon until the center is covered. Leave the edges of each circle clean from filling. If you add too much it will spill over onto the pan when baked. Bake for 20 minutes or until puff pastry is golden brown on the middle shelf. Remove from oven and gently place a scoop of buffalo chicken in the middle. The middle will sink a bit. Garnish with diced celery. I just made these for a couples' baby shower, and they were the hit of the party! Thank you so much! I'm passing the link along to about 10 friends and family. Great blog — I'll be back!